The technique of stone etching dates back to the 16th century. 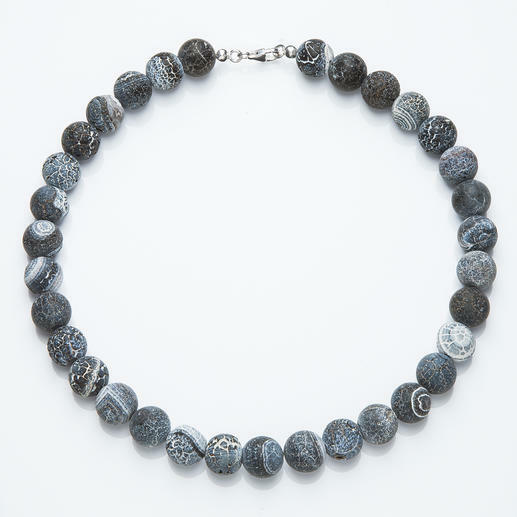 Its many different shades of grey-blue make this necklace great to team with a number of outfits. Each of these necklaces is unique. Grey-blue agate with individual etching. Even in its natural state, agate often has interesting, streaky markings. And etching gives the semi-precious stones an even more dynamic look and beautiful matt finish. Limescale deposits on the agate pearls are dissolved using acid, thereby creating their delicate, light coloured surface with noticeably deeper areas, grooves, lines and microscopically fine hairline cracks. Each agate pearl has a very different individual structure. This means no two necklaces are exactly the same. It looks perfect with blue and bleached denim, navy blue blazers, cobalt blue dresses, etc. The pearls are approx. 12mm (0.5") in diameter. Measures approx. 42cm (16.5") in length. Weighs approx. 69g (2.4 oz). Lobster clasp and calottes made of 925 sterling silver. Very pleased with the necklace and the individual stones.